The 2018 Tlu-piich Games began today with heats for the 100-metre races at Bob Dailey Stadium in Port Alberni. It was a sea of cedar hats as elders from across the province dressed in their finest regalia lined up at the parking lot of the Island Savings Center in Duncan. They awaited their grand entrance at the opening ceremonies of the 42nd Annual BC Elder’s Gathering (BCEG). There was joyful excitement in the air as hundreds of Ahousaht members filled Maaqtusiis School Gym on June 21, honouring the invitation of their Ha’wiih (Chiefs) who asked them to come home for three days of family bonding and cultural growth. Hundreds of Nuu-chah-nulth families packed the Alberni Athletic Hall to celebrate the educational successes of their students. The NTC Scholarship Celebration and Graduation Ceremonies took place Saturday, June 23 at Port Alberni. Sixteen former students of Tlucha Children’s Centre and the Opitsaht preschool sang and danced in celebration of the grand opening of a new centre for young ones on May 3. Grace George acknowledged and thanked the students for taking time during recess to learn the song and dance. On Friday morning the Tseshaht handed out sea urchins and sea cucumbers to its members outside of Maht Mahs on the First Nation's reserve. The seafood was distributed by the Tseshaht's fisheries department. On Wednesday (March 28) the Uchucklesaht Tribe held an education and career fair at Maht Mahs in Port Alberni. 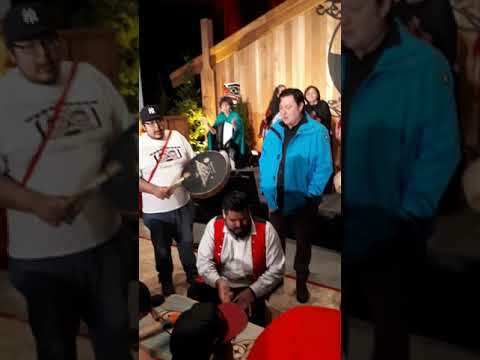 Tseshaht First Nation hosted its biennial Baby Welcoming on March 17, split between Maht Mahs and the adjacent Longhouse. Moms (or grandmas or aunties) were invited to bring their babies for an introduction to Tseshaht culture, according to co-host Debbie Frank. Students from John Howitt Elementary took part in a spirited lahal tournament with their counterparts from Nanoose Bay, as part of a cultural exchange at the Tseshaht Longhouse on March 9. Lineups began this morning by Maht Mahs for the distribution of halibut from Tseshaht and Hupacasath fisheries. Tseshaht members received their food fish just after 10 a.m., followed by Hupacasath members later in the afternoon fromt 4 - 6 p.m.
About 300 people donning Cowichan sweaters or other regalia arrived at the Quw’utsun Cultural & Conference Center on a bitterly cold Feb. 10 morning to take part in a walk to bring awareness to the unsolved cases of murdered or missing Indigenous people. The province and local governments within the Alberni-Clayoquot Regional District have joined forces to launch the BC Poverty Reduction Strategy, which involves a series of community consultations across the province, including an event in Port Alberni on Jan. 23. With hundreds in attendance, the Alberni Athletic Hall vibrated with Nuu-chah-nulth culture on Saturday, Oct. 21 as the late Wally Samuel Jr. was honoured with a potlatch. Sept. 25 was a proud night for those in attendance at Maht Mahs in Port Alberni, as several individuals were recognized for the leading roles they took in progressing the lives of Nuu-chah-nulth-aht. From Tuesday to Thursday this week, over 20 families of missing and murdered Nuu-chah-nulth women and girls converged at Maht Mahs gym in Port Alberni. Those affected by the tragedies shared their stories over three days of culturally-based healing. Softball took over Recreation Park Saturday as part of the 2017 Tlu-piich Games, including a fast-pitch tournament involving five teams. The final game is scheduled for Sunday at 3:30 p.m. Another five teams contended in a slo-pitch tournament set to conclude Sunday at 2 p.m.
A 30-degree temperature didn't stop the Tlu-piich Games' track events Thursday at Bob Dailey Stadium, including races that engaged ages 4 to over 60. Photos by Eric Plummer and Denise Titian. The 35th Annual Tlu-piich Games opened Aug. 8 with welcome songs from the two nations whose territories are within the Alberni Valley; Hupacasath and Tseshaht. Hupacasath singers of all ages, led by elder Harry Lucas, welcome visiting nations to Port Alberni. The Tlu-piich Games began in Port Alberni on Tuesday with morning canoe races at Canal Beach. Pictured are Josh Fred and Vance Seiber of the Tseshaht First Nation, who paddled to a win in their 200-metre race in the adult category. Other races were held for 7-10, 11-14 and 15-18-year olds. Nuu-chah-nulth families living in Nanaimo filled the St. Peter's Church Hall on the afternoon of Dec. 1 to enjoy an evening of family fun and turkey dinner with all the trimmings.